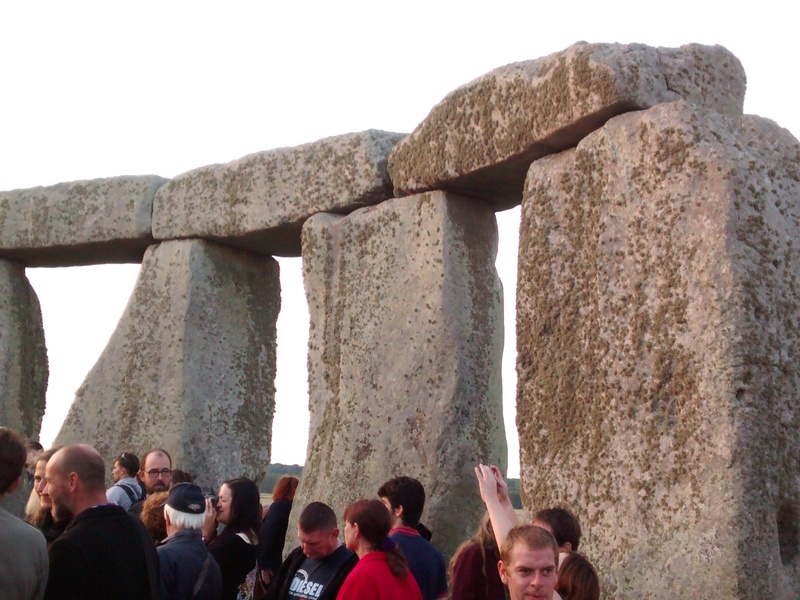 Stonehenge: there’s something about it isn’t there? It’s a family joke that I become very animated every time we drive past the site and combined with my childhood memories of being allowed to walk amongst the stones pre-barrier days, it has always held a special place in my heart. Hence my determination to one day experience a Summer Solstice. However, I am a fair weather determinator so a rainy mid-summer day will put a dampener on my inner hippy spirit…hence the reason I have only now, in 2014, managed to achieve my aim. Thus armed with the information from the Stonehenge website http://www.english-heritage.org.uk/daysout/properties/stonehenge/summer-solstice/?lang=en I decided to disregard their advice that was heavily weighted in favour of using public transport and I set off at 4.30pm on Friday 20 June. The journey was straight forward and the road clear, which is why I arrived at 5.45pm a whole one and a quarter hours before the gates to the car-park opened and so began my half hour of frustration as I drove to the key roundabout only to be waved on by the police; not even so much as a kind suggestion as to where I could wait, there being road cones along the entire stretch of the road obviously aimed at the likes of me. I was beginning to think my decision to avoid the Red Bus had been a little unwise. But after my third attempt at the roundabout, I tried a different tactic and joined a long queue of traffic on the other side of said roundabout. The time was 6.30pm. 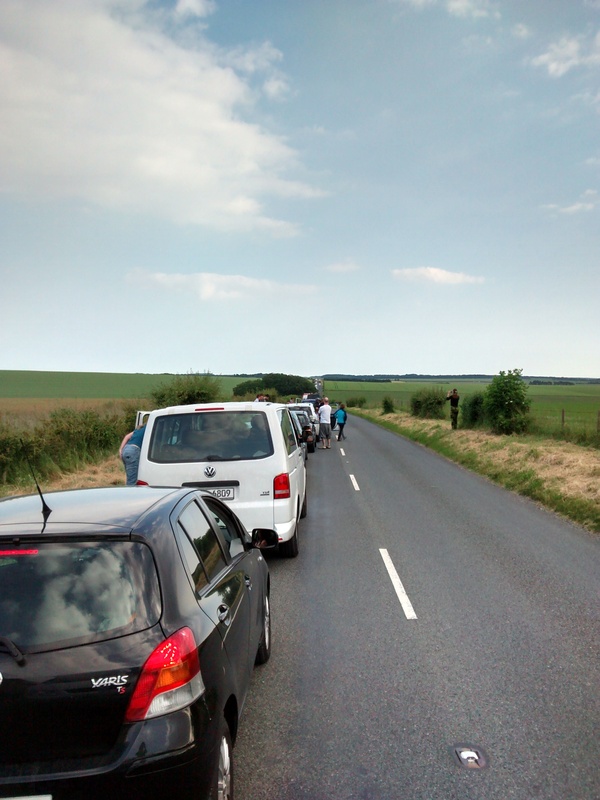 It was a very long queue but the officers patrolling the road assured me there would be plenty of room for everyone in the field car-park. 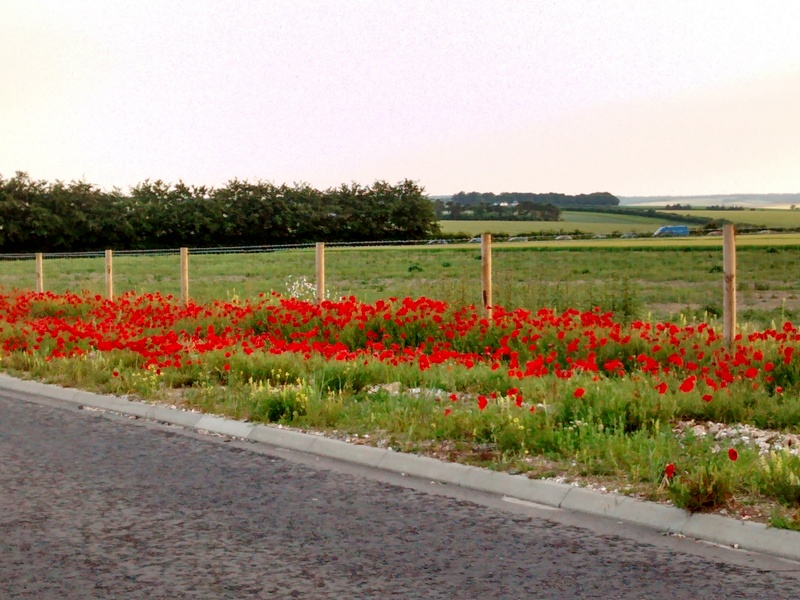 I noticed also that the verges were festooned with red poppies giving it something of a peaceful and comforting feel about it. By 7.15 I was on my way. 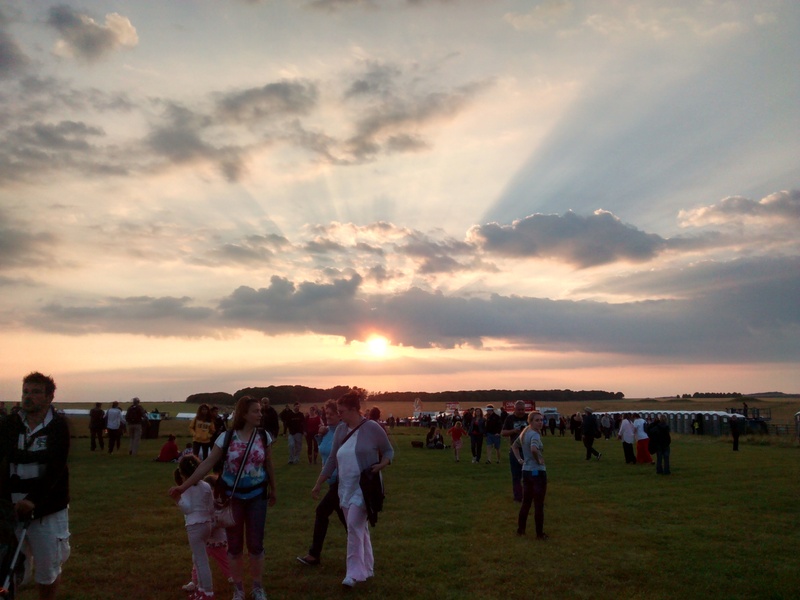 The scenery along with the thought of my imminent arrival at the ancient monument was starting to put me in touch with my inner childhood hippy spirit and even without kaftan or guitar I felt the urge to break into a Joan Baez hit. I was soon bumping over the stubble, clouds of dust rolling in waves as the various vehicles trundled across the dry bumpy field to their allotted spaces. Now if I have one pet hate of such events, it’s the loos. Cameron Diaz has to open every door she goes through with her elbows, I like to have a flushing loo with soap and water for hand washing. 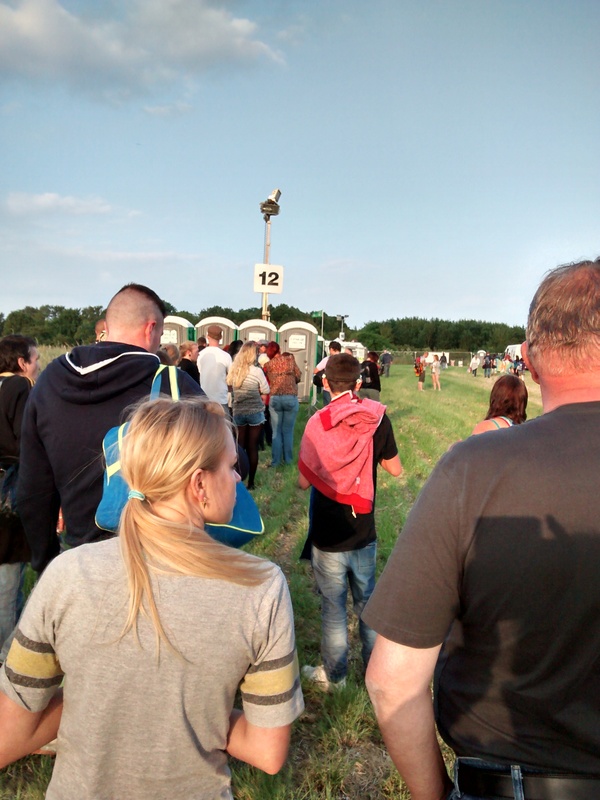 So the portaloo WC for me is right up there with cleaning off dog poo from shoes…you have to do it or suffer the consequences! So I joined yet another queue. NB My advice is to take some hand wipes with you to give your hands a clean afterwards. 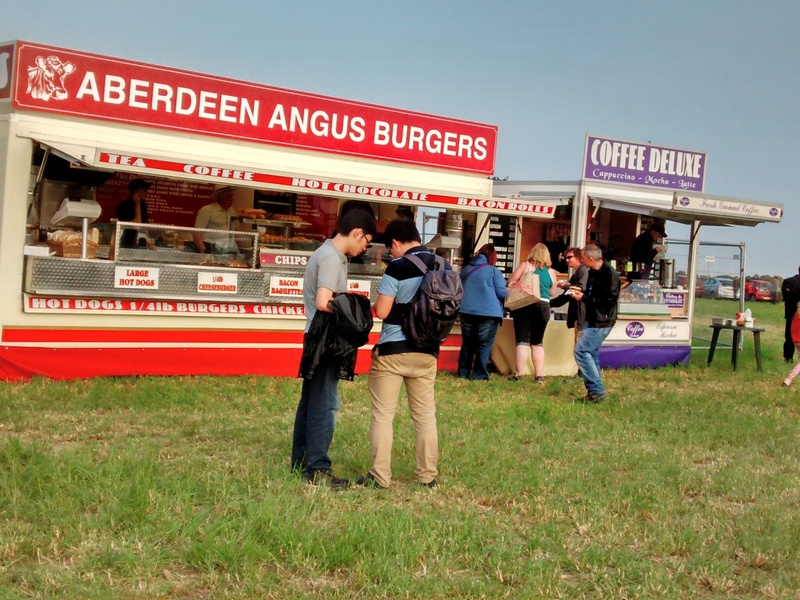 The food stands were ready to take orders from hungry visitors but nobody was in any hurry to eat. NB My advice is to take a picnic including hot drinks for later. I had a burger that looked the part but I could have been eating anything! 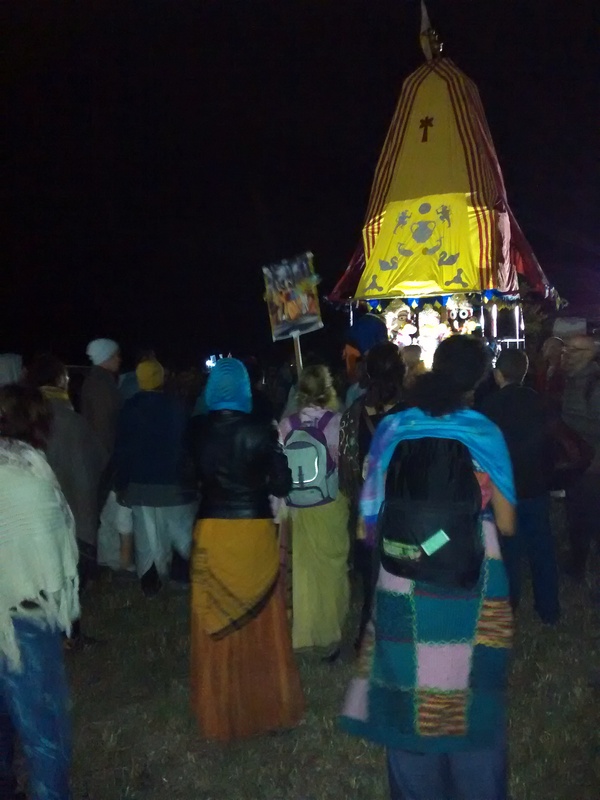 There were several cloaked and head-dressed characters who obviously planned to carry out some pagan ritual later (to my knowledge no one was sacrificed that night). Some people staked their claim of green by laying out blankets, others wandered amongst the huge monolithic stones, touching them, meditating against them or photographing them, but at all times marvelling at the sheer enormity of their size and the inexplicable strength and determination required to transport and erect them all those thousands of years ago. 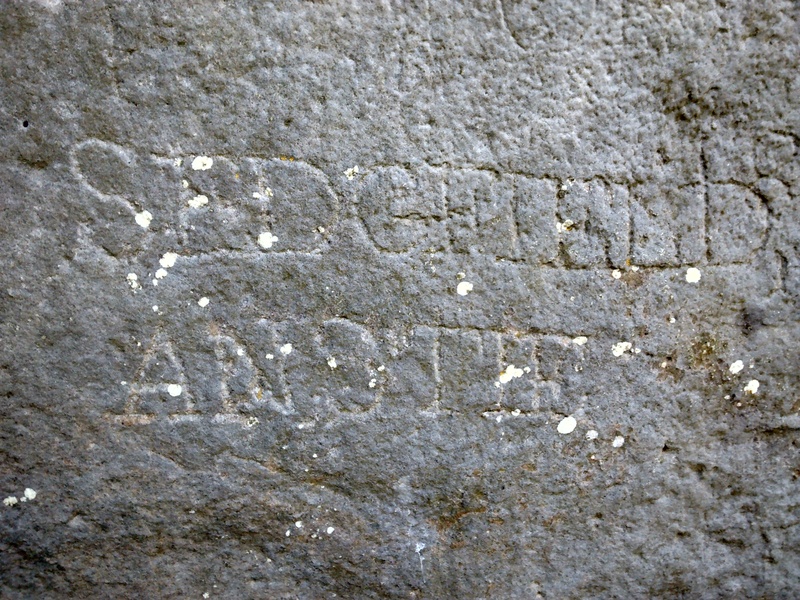 I found some interesting engravings along with other markings from centuries past, so it seems vandalism has always been a problem at Stonehenge! However, what didn’t sit comfortably with me was the way some people clambered on the stones, almost as if they were on a hill climbing expedition. That childish I’m the king of the castle attitude sprung to mind as people jostled to get on top of the recumbent rocks showing scant respect for their original purpose. There was a wide range of people there, from toddlers who were carried safely on a parent’s shoulders, to born-again hippies and grandparents who were probably reminiscing their hippy-hey-days. I met some interesting people including Paul Hooch Darcy from http://impressdesign.co.uk/ who told me it was his 17th Summer Solstice and that it was “all about love and that it had nothing to do with the banks or the rubbish of life but being in love with what might be”. I did query the fact that the site was most likely used as sacrificial alter but he pointed out that even that was done with, albeit a pagan love of the various deities. I also met Elainia, a member of the Hare Krishna group who were performing their standard song and dance routine; she told me she was from Lithuania and had been raised as a Christian but at 17 years old felt there were too many unanswered questions which is when she turned to the Krishna belief. Certainly a happy bunch! Anyway, I soon welcomed my decision to park there as it was only 9pm and it was getting chilly, so I was able to sit in the relative warmth of my car. The sun set by this time had lit up the sky in biblical proportions. 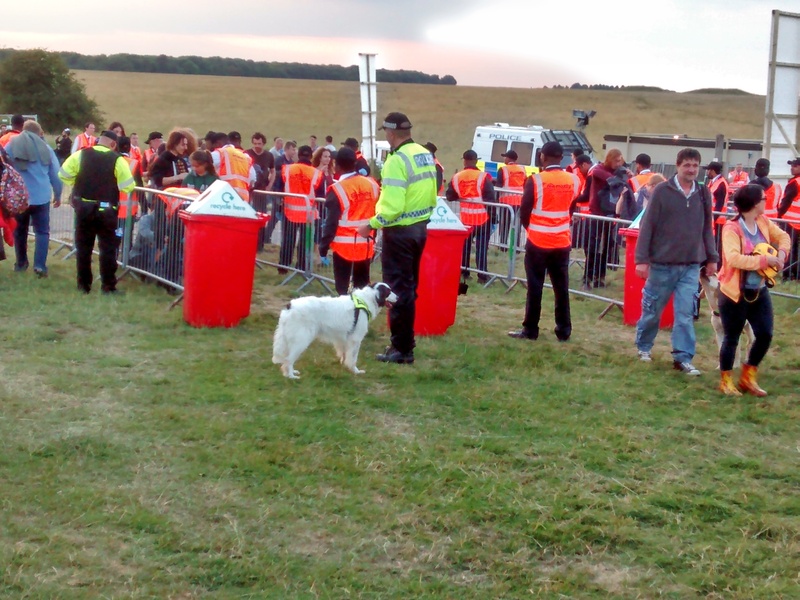 Of course with any event involving large numbers of people, you have to have security and the Wiltshire police force were backed up by a number of different firms who checked bags and tried to stop prohibited contraband from entering the site e.g. duvets, tents and glass bottles. 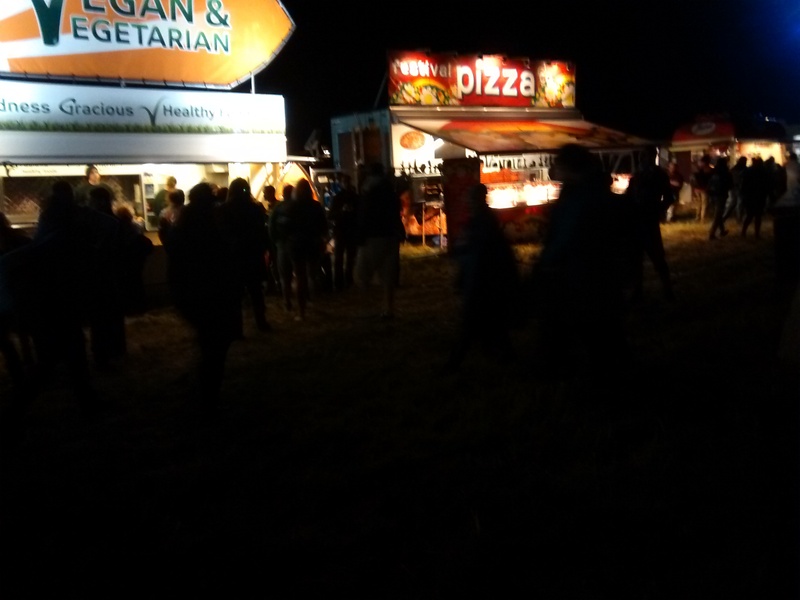 By the time it was dark the food kiosks were lit up and sadly gave an air more akin to Blackpool illuminations than Ancient Man’s desire to get close to his inner self. 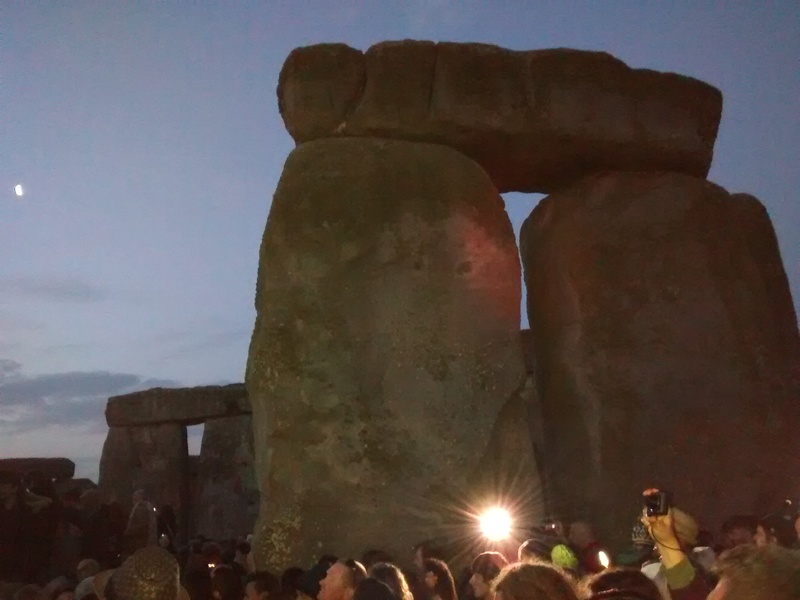 Stonehenge at night takes on a whole new meaning for me. Those huge lumbering rocks that stand resolutely rippling their solid muscles during the day, become peaceful resting giants at night. Settled, calm but still very strong; a gentle Goliath. As you make your way towards the Circle, whilst there are plenty of floodlights in the area, it is not actually that easy to see what, or rather, who is lying on the floor. A torch is very useful to avoid stepping on someone’s feet or head! Though I have to say a large number of people were completely paraletic by this time so probably wouldn’t have felt anything, I also have to wonder at those people who had drunk so much they were out for the count and missed the whole thing! Then the night sky starts to brighten in the east almost imperceptibly at first, but soon you detect a definite change. 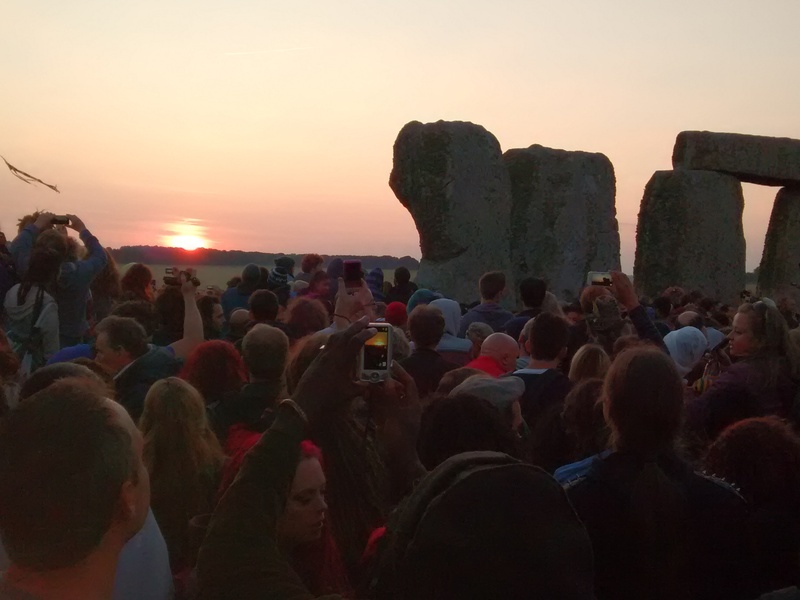 The excitement builds and you can imagine just how important it would have been to the pagan druids as they welcomed the longest day of summer. There were shouts of delight, whistling and clapping as the horizon slowly but surely started to glow. I was hoping to see a sudden shaft of ‘Indiana Jones’ styled sunlight shoot straight through the gap down the middle of the two main pillar stones and whilst it’s possible the rays did dart between the rocks, it was impossible to see due to the number of people there. 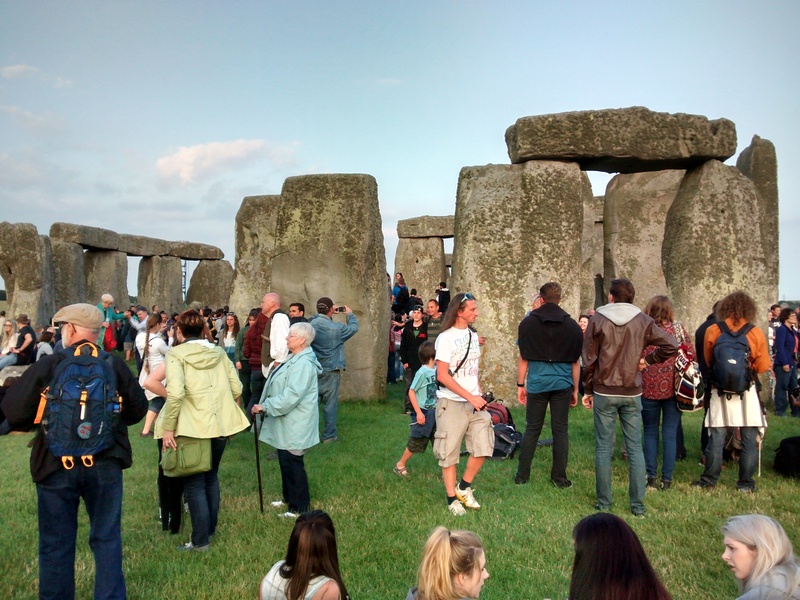 But what it did show was the unregulated open-armed welcome Stonehenge gives to everyone, no matter what creed, culture, religious belief or life philosophy and everyone felt they could have a share in that free love…say wasn’t that what Paul had said? 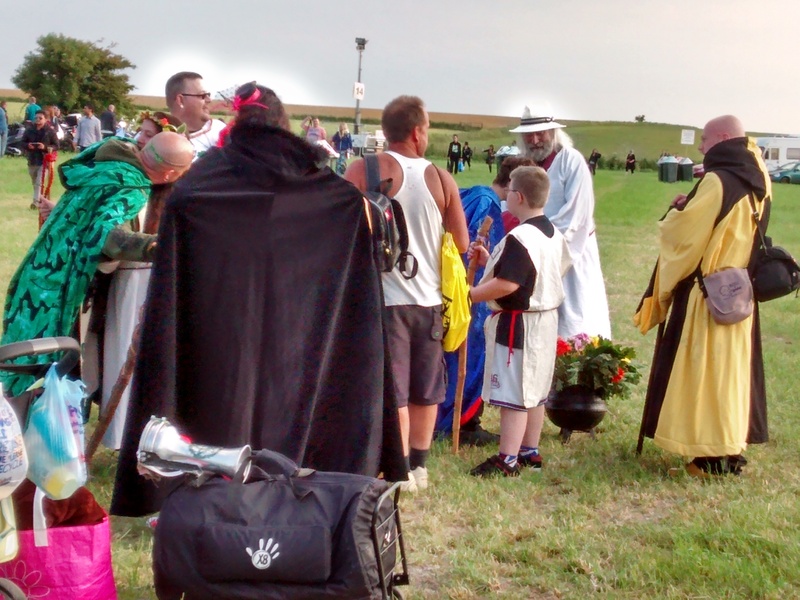 It was without doubt an experience I’m glad to have enjoyed but I think I’ll leave it to the die-hards and druids to enjoy it as an annual event. 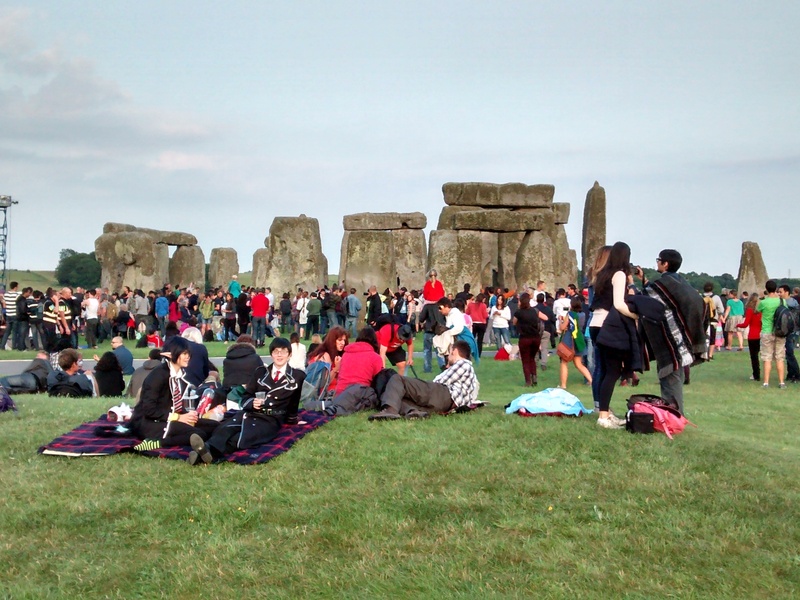 This entry was posted in Special events and tagged druid, hippy, Joan Baez, love, pagan, Stonehenge, summer solstice. Bookmark the permalink.